A strong, silent stranger rides into the lawless lands of the western frontier, battles horse thieves, deals with unyielding scoundrels, and wins the heart of a schoolmarm. Owen Wister's 1902 classic-the first great novel of the American West-is rich in moral drama and vernacular wit. His hero-like knights of old-lives by an enduring code of chivalry and is governed by quiet courage and a deep sense of honor. Set in the vast Wyoming territory, this masterpiece helped establish the code of the West and its stereotypical characters: the genteel but brave cowboy, the pretty spinster from back East, and villains beyond redemption. The novel is also on record for incorporating the first known 'shootout' in American literature. 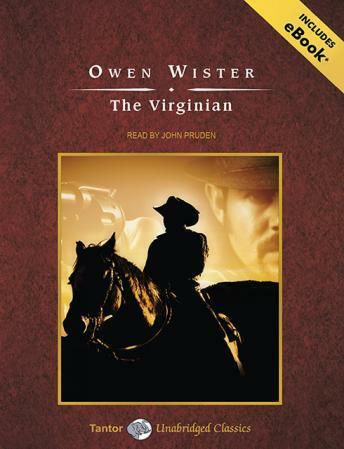 In 1977, The Virginian was voted by the Western American Writers as the greatest western novel of all time. Brimming with action, romance, and atmosphere, it remains a classic of frontier fiction.